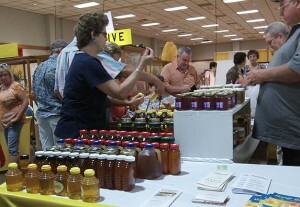 KSBA and the State Apiarist operate a Honey Booth each year at the Kentucky State Fair. The purpose of the Honey Booth is to promote the sale of Kentucky honey and beeswax and to teach about the importance of honey bees. KSBA members can sell their honey or beeswax at the Honey Booth. KSBA keeps a 30% commission on all honey and beeswax sold. The prices for honey and beeswax sold through the 2016 Honey Booth can be downloaded here.